Soooo, still in Pembrokeshire and still having fun! 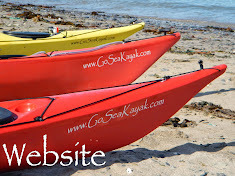 Todays paddle is a very pleasant route along some very scenic and dramatic scenery between Fishguard and Pwllgwaloed. The sun was out which made a nice change as we set off from Fishguard harbour. This one is called Needle Rock and has a lovely arch through it, fun in the swell. We soon land at Pwllgwaloed, our half way point and have some yummy lunch! Then we slowly head back to Fishguard enjoying more rock-hopping as we go. Strangely the swell had totally vanished for the paddle back so we were able to explore more than we did on the way out.